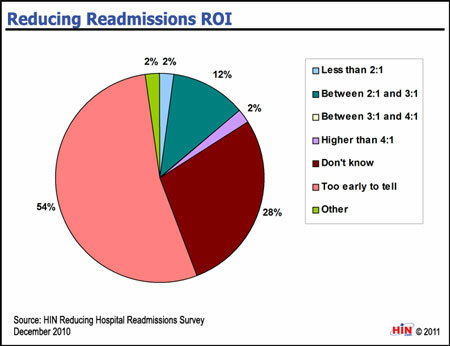 Healthcare Intelligence Network- Chart of the Week: What's the ROI from Reducing Readmissions? Share this data with a colleague! New Chart: What's the ROI from Reducing Readmissions? SUMMARY: From payors to providers to CMS, avoidable hospital readmissions are receiving national attention as a way to glean savings from the healthcare system and improve the quality of care that patients receive. We wanted to see the ROI generated by programs focused on reducing readmissions. Click here to see a larger, printable version of this chart. Download the executive summary of the 2011 Benchmarks in Reducing Hospital Readmissions. 2011 Benchmarks in Reducing Hospital Readmissions is a 45-page special report that quantifies efforts by 90 healthcare organizations to reduce avoidable readmissions in their most vulnerable and high-utilization populations, as reflected by responses to HIN's second annual survey on Reducing Hospital Readmissions, conducted in December 2010. An all-new follow-up to the best-selling 2010 edition, this resource is packed with new metrics on current and planned programs to reduce readmissions, presented in more than 40 easy-to-follow graphs and tables. 2011 Benchmarks in Reducing Hospital Readmissions is available from the Healthcare Intelligence Network for $149 by visiting our Online Bookstore or by calling toll-free (888) 446-3530. IMPORTANT NOTICE: This information is designed to provide accurate and authoritative information on the business of healthcare. It is distributed with the understanding that Healthcare Intelligence Network is not engaged in rendering legal advice. If legal advice is required, the services of a competent professional should be retained.